This bar changed the way I think about chocolate. It was introduced to me by someone who's so thoroughly geeked out on the stuff that Hershey (and even some of the other big players) have become dirty words. 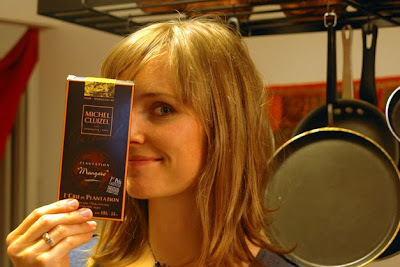 My mentor, together with the French chocolatier responsible for such pleasure, revealed chocolate's depth and complexity to me. It was like moving from Baby Duck to a good pinot, from Kraft parmesan in plastic to Reggiano. With its $7-$10 price tag, this bar taught me that when it comes to quality, a little will go a very long way. This is a brand new series, kids! I want to know all about your dessert-ventures. Talk me through it, walk me through it. Show me what you got! Thanks for having me, Kris! No, thank YOU Jen! Must try Madagascar Bar soon. I still have to thank you for introducing me to Vosges.